Gary W. Edmonson=s dedication to military service began at the young age of 12 when he was a Boy Scout and played taps at military funerals. In 1955, he entered the military service at age 21 and was stationed in Fort Knox, Kentucky. Being a musician, he applied for and was accepted in the Army band. During his next three years, he played for military services at area grave sites. He was honorably discharged in 1958 and stayed in Louisville, Kentucky where he contacted local funeral homes to let them know that if a bugler was needed to play taps he was available. His work as an insurance salesman allowed him to take off at any time or day to provide his music. In 1962, he transferred to Lafayette, La., and he again contacted the local funeral homes to let them know they could call on him to play for veterans= funerals at no cost. His services were used at many military functions such as Memorial Day, Veterans Day and many other military services. In 1966, he headed a program that created the Lafayette Community Band which consisted of the top musicians of the area. It still exists today under the direction of Gerald Guilbeau. In 1977, he also created a Summer Elementary Band for 6th, 7th and 8th grade students. With the help of then Lafayette Mayor Kenny Bowen, and many of local businesses, he began the program called BEST (ABank of Elementary Student Talent@) for a 7-week musical program at no cost to parents. In 1990, he teamed with the VFW Judice Post 9822 and became their bugler. He could not become a member because he was not a war veteran, but he was accepted as a honorary member. 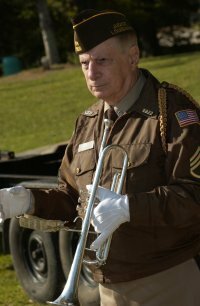 He has donated many hours of his time playing at funerals, parades, nursing homes, schools and churches in order to honor our veterans. In 1995, the United States celebrated the 50th anniversary of the end of WWII so he, with the help of Rudy Bourque, honored over 200 WWII Veterans at the Heymann Center, with all of the food being donated by the various businesses. In 2000, Rudy Bourque helped to start a program called AmVets, a military program for all veterans. About 15 years ago, he added military music at the grave site. As the coffin was being brought from the hearse to the grave site he would play the military branch song of the deceased. As they folded the flag he would play The Battle Hymn of the Republic and finally after they fired the rifles for the 21-gun salute, he would play taps. Since there are no longer enough riflemen, he now fires a rifle and then plays taps. Clearly, he has dedicated his life to serving the community by honoring veterans during their last time on earth. He is married to Darcus and they have six children, 13 grandchildren and 4 great-grandchildren.